A STAUNCH family-man, you can see the pride on Dale McNellee's face as he talks about his three sons, their extended family and, if his crossed fingers are any indication, the pitter-patter of grandchildrens' feet in the not-too-distant future. But as his family continues to grow, his Toormina home no longer feels as big as it used to. For the past six years, he and his wife Leonie have longed to host the annual Christmas celebration, but with most of the clan living in Queensland, it means needing the room to house everyone for a night or two. With space the limiting factor, Christmas at their place has been off the cards. Until now. The Coffs Harbour couple is ripping down their deck to extend their home to add a large entertainment area with plenty of space for sofa beds. Leonie and Dale McNellee will rip down their deck to build their extension. Dale said it was a dream coming to fruition. "A long time ago we wanted to do an extension on the house, but the financial provider we were with at the time knocked us back," Dale said. "We left it a while and then re-looked at our finances and we're now in a good position to try again. "We went to Newcastle Permanent with fully-drawn plans and costings and we were told 'go for it'. "So we're adding a 9m by 4m extension onto our home which will be an enclosed entertainment area with dining and lounge suites with sofa beds and a pool table so the family can come and visit us and we'll have room for everyone to stay." 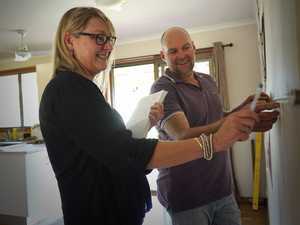 Dale and Leonie say doing your research and planning was key to kicking off any renovation. The extension will also create an outdoor entertainment area beneath the house to complement their large backyard - and a pool is next on the wish list! The extension adds to the small renovations they have already done to their brick home including the installation of a modern kitchen eight years ago and a new floor. "We know how much value that added to the house so this is the next step to make our home more functional," Dale said. The couple has refinanced their home with Newcastle Permanent to bring their dream to life, of which Dale said was a simple and painless process they're "so glad they did". "They'll listen to what you have to say and really accommodate your needs," he said. "I can't speak higher of them - they've been really, really good." They can't wait to have Christmas at their place this year, thanks to the extended space. Newcastle Permanent Coffs Harbour Branch Manager Erica Farag said working out what equity you had in your home could help when considering a renovation. "Like in Dale's case, your property may have increased in value over time," she said. "So if you're thinking of refinancing, have your property revalued to see what value it has above the remaining mortgage. This is what we call the equity. "If you've been waiting to have savings to renovate, you may find you can tap into that equity." She said refinancing could save you dollars. "Any time is the right time to refinance if it could save you money," Erica said. "There may be different financial products that weren't around when you originally got your loan, so you can make sure you have the best loan structure to suit your needs." For the McNellee's, a rejig of the way they were paying off their home meant they could make their dream come true. And little does their family know when they arrive for a festive lunch this year, they'll be walking into a home and a half. "We're keeping it a secret from the family for now… at least until they read this!" Dale said. For more advice on refinancing, phone Erica at Newcastle Permanent in Coffs Harbour on 6652 6059.